E.SUROV: So, to start with let's talk about what has happened. Frankly speaking, after the second playing day, most of the amateur players and spectators, including me, thought the winner was already determined, because in the last game of day 2, in Round 10, Magnus Carlsen beat you - his nearest rival - and took 1.5 point lead. This is what the amateurs were thinking, but we are interested in what were you thinking. S.KARJAKIN: Yes, that was really a very unpleasant moment for me. I was doing so well – I scored 7 out of 8; then I lost against Mamedyarov. It was a great game, he played well, and that’s why I think the result was logical, whilst the game against Magnus in Round 10 was really upsetting. The game was full of fight, we’ve been fighting till the end and the position was practically drawn, but eventually I’ve spoilt it. I mean I could make an easy draw and then I had to “move” Bf6 in the end, I was going to do so, however, at the last moment I changed my mind, blundered and had to resign immediately. I just didn’t have time to calculate Bf6, I had only 10 seconds left, so… Well, anything can happen in a time trouble. It was really a very upsetting moment and I’m very happy that I managed to outlive it. I guess my first game at day 3 played against Ivanchuk was a turning point. I don’t know computer evaluation of the position but I think that the fight was approximately equal during the entire game. He got a slight advantage in the end, but he forgot about the time control and lost on time. This gave me a motivation and I understood that my only chance was to win all other games and just see what would happen. Then I was lucky because Teimour Radjabov played the variant I was familiar with and could react correctly and accurately. I just got an advantage with black and managed to overplay him. Then I just exhausted Murtas Kazhgaleyev. 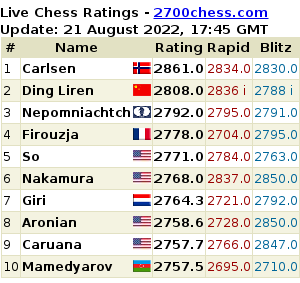 After the 3rd game I already surpassed Carlsen, so it was clear that everything was in my own hands. E.SUROV: What has happened after Ivanchuk lost on time? I mean how did he react? What was your reaction? S.KARJAKIN: His reaction was normal. I mean, of course he was upset, - anyone would be upset, but in general it wasn’t a tragedy for him. We even discussed the game a bit after it was finished. As his next game against Magnus showed he completely recovered after it. Generally, when playing against Ivanchuk I understand that not everything depends on you, it mostly depends on how Vassily is playing. That’s because, let’s say, he lost on time playing against me, but then beat Carlsen with black; they say he played brilliantly. Of course, it’s not easy to play against him at all. E.SUROV: Did you think that Magnus could lose two games in a row? Because if he was also winning the left games, the distance between you would stay in his favor. S.KARJAKIN: Sure, that’s clear. But on the other hand, I was thinking that he would start making draws, so I needed to win as much games as possible in order to still maintain some chances. In any case, my only chance was to play each game till the end. So, I did my best. I scored 4 out of 4 and drew in the last round because it secured the title for me. E.SUROV: Regarding the last draw. Tell us honestly – your rival was Russian Igor Kurnosov – haven’t you thought to arrange the result before the game has started? Because you know the draw was making Sergey the Champion. S.KARJAKIN: Well, maybe such a thought occurred, but Igor said he had nothing to lose – in the case of victory he would take some 10th or 11th place, if I’m not wrong. So, he just showed that he was going to play till the end. For all I care – I was ready to play. E.SUROV: Probably the person who has nothing to lose is the most dangerous to play with. S.KARJAKIN: Yes, indeed, the most dangerous. In fact, this draw wasn’t an easy one for me, because everything was at stake. At some point I felt like Anand when he played against Gelfand the last rapid game. He also saved a worse position with white in the situation when he needed a draw. I got the position much alike that one. It’s not that easy from a psychological point of you, especially when the person tries to complicate the position. But eventually I somehow managed to hold. E.SUROV: Tell us more about rapid chess. What is special about it? What is that obvious thing that one should have in order to play rapid? S.KARJAKIN: I think rapid is a very harmonious form of chess, which unites the advantages of classic and blitz. On the one hand, you have time to think, develop some ideas and on the other hand, there’s no that insanity like in blitz where you can just blunder rook, mate, so on. It usually ends with just making moves rather than playing. That’s why I really enjoy rapid. Regarding the qualities – I don’t know. I guess opening is not that important in rapid. I wouldn’t say I won any games because of openings only. Of course, in some cases I was grabbing some advantage in the openings but usually everything was decided at the end of the game – when you were short of time. I think that is an ability to play in a mutual time trouble. I guess that’s it. E.SUROV: Aren’t you contradicting yourself? You just said that on the one hand, you have time to think in rapid, but on the other hand, everything is decided in the end – when you are actually in a time trouble. And your game against Magnus is a good example, because you just didn’t have enough time to calculate Bf6. S.KARJAKIN: Generally yes. But that is only one side of the medal. Indeed, maybe, I messed up a bit. On the one hand, a lot is decided in the time trouble, but it also happens that the game is over before the blitz. That happened in my games as well. For instance, someone can be playing quite quickly and strongly, while others can just collapse in a time trouble. That’s usual in rapid. One should just be playing strongly and quickly. E.SUROV: They say that the rapid players are divided into two groups: ones are playing very quickly, they aren’t making all the strongest moves, nevertheless, they always have more time than their rivals. Others prefer having an accurate thinking mode and developing the strategy. They know they will have a time trouble or at least they will have less time than their opponent, however, they hope to overplay. Do you agree with it? If yes, which group do you belong to? S.KARJAKIN: I think those are two extremes, which should be avoided. I can give you an example. I played against Boris Gelfand in Round 1. Actually, I was late to my flight; I couldn’t attend the opening ceremony because I flew to Astana on the first round day, so I wasn’t quite fresh. [...] Well, not that I was late on my flight, but… My route was Simferopol – Moscow – Astana. There was three hours difference between those flights. My flight in Simferopol was delayed for exactly three hours, so I just couldn’t get to the flight to Moscow on time. I flew to Astana next day at 6 in the morning, while the round was starting at 15:00. So, when I was playing against Boris I was a bit sleepy and I was spending a lot of time in the opening. Eventually, I had 20 seconds against Gelfand’s 7 minutes in a complicated position. Fortunately, he started to blunder and soon resigned. Anyways, I don’t think that strategy is good, you shouldn’t let that big difference on time. You should play calmly. Here’s another example, I didn’t have time difference in the encounter against Ivanchuk. Both of us were playing more or less reasonably, so what has happened during blitz is a completely different story. E.SUROV: Is 5 rounds a day – too much, enough or maybe there had to be more games a day? S.KARJAKIN: That is quite much. On the 3rd day I was feeling really tired. Five games a day seems perfect to me, because if there were more games, there would be more blunders. S.KARJAKIN: Well, despite the fact that I lost against Magnus Carlsen, I guess that was my tensest game here. It was unclear till the end. However, there also were some other tense games. 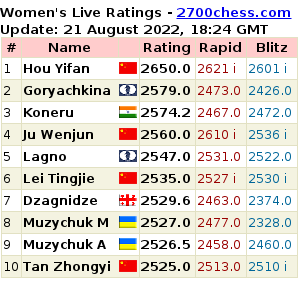 For example, the game against Ivanchuk, the encounter against Morozevich. In general, nobody was offering a draw here, first of all because it was prohibited. Everyone fought till the end, so all the games were quite tense. E.SUROV: How do you think, Sergey, is it a fair system if 10 participants from 16 are invited due to their ELO in classical chess, while only three players are qualifying for the championship? S.KARHAKIN: That’s a hard question. And probably the organizers should be asked that. As I got it, now there will be made a new rapid rating system. So, it will work for the next rapid tournaments. E.SUROV: So, has anyone, let’s say Carlsen, congratulated you after the game? S.KARJAKIN: Yes, he did. Actually, at the press conference he even said I deserved this title because I was winning my games. E.SUROV: Who else has congratulated you? S.KARJAKIN: Practically all of the participants congratulated me. Actually not only participants. For instance, Vladimir Kramnik and some other players have also congratulated me with this victory. They were just happy for me. I’m pleased that I have some friends in my professional world, the ones who support me. That makes me happy. E.SUROV: So, you will be participating in the Blitz Championship. Do you think you are a good blitz player? S.KARJAKIN: That’s a hard question. I played blitz at several Tal Memorials. There were different results, but as I remember my best result was the 3rd place. I know that I can tie for a more or less good place if I will be playing strongly. That depends on how quickly I will recover and how good will be playing other participants. Actually, blitz is an unpredictable format. Taking into consideration that we will have two days with 15 rounds each, anything can happen. I won’t be surprised by any kind of result. I will be trying to do my best. Evgeny Sveshnikov: "I'm Surprised by Anand's Insipid Play"
E.SUROV: We are at the World Championship Match. I’m Evgeny Surov and next to me is Evgeny Sveshnikov, who got here just in time. Did you really guess it? Did you know what was going to be played today? Cristobal Henriquez of Chile beat Boris Gelfand in the first round of the FIDE World Cup in Baku. Right after his triumph, the young IM gave an interview to our website, with the assistance of his coach GM Rodrigo Vasquez. Mark Dvoretsky: "In the Tretyakov Gallery I had Time to Think Over What Was Happening, but in Batumi I Haven't Got Enough Time For That"
Z.STURUA: Mark Izrailovich, you were visiting the Tretyakov Gallery practically every day. Where it was more interesting – there or here [in Batumi]? Everybody writes that there were some underlying reasons, subtle preparation, “the tip of the iceberg” – those are the opinions widely discussed. M.DVORETSKY: Well, it was more interesting there.